How does your business look from the outside? It’s really, really difficult to look objectively at one’s own business communications. * Your business communications are broader than your services, products or offerings. They speak to your strengths, your experience and the benefits you offer. All your business communications- your copy, logo, website, emails and social media- tells a story about your business. Are your messages are clear and compelling? 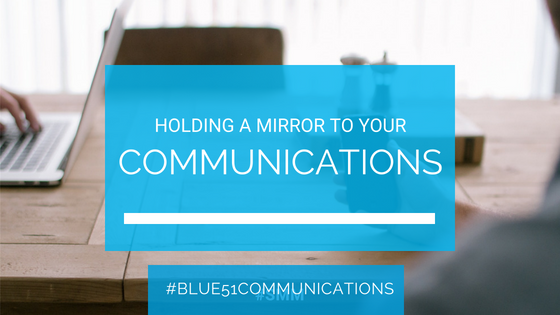 Is the way you communicate your business aligned to your values and reflective of your values? Are the aligned to those of your ideal client? There’s a number of ways to look at your communications from the outside, but an easy (ish) way is to take the perspective of your ideal client and how they engage with your touchpoints. This can be an incredibly valuable exercise. 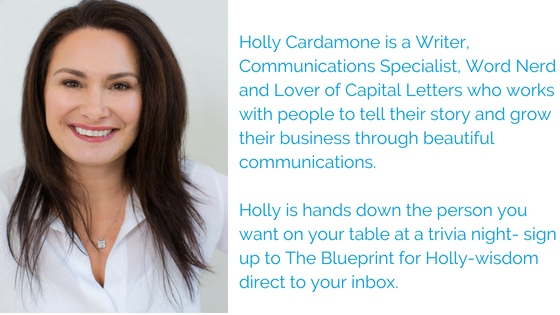 People with gmail (or God forbid, hotmail) as their business email rather than a dedicated URL eg holly@blue51.com.au. Most hosting packages come with email hosting as part of the deal- mine certainly does, so if yours doesn’t, have a shop around. An about page that’s lacking in brand story. It doesn’t have to be Pride and Prejudice, but some copy that covers off the who, why, how and what is a way to connect with your ideal client, and also paints a picture of your business. Psst- want a freeby checklist for your about page? Imagery that’s bad, or worse, absent. Invest in a branding shoot with an amazing photographer (I love this one and this one) and use the imagery across all your touchpoints. A lack of consistency in colour, font, sizing and tone speaks to a lack of processes and frameworks. It’s an easy fix, my pretty. If you’re not particularly visual (I’m not), engage a designer to create a visual style for you, specifying the fonts and colours that best suit your branding, and apply them religiously across your business communications. I’ve had some people tell me they rely solely on word of mouth marketing for their business. I’m a massive fan of providing service so exemplary that your clients do your marketing for you, however keep in mind, the vast majority of people when given a recommendation by a trusted friend or family member will head straight to Dr Google to check out your business. What happens when someone googles you and your business? You want to look as good, as professional as your clients are telling their friends you are. Tell me, how does your business look from the outside?